During the last two winters, I’ve shared my recipes for snow ice cream and the chocolate version after snowstorms. It usually takes me a few storms to get the recipe right. This winter, though, I’ve been getting lots of time to play with new flavors. Strawberry seemed like the obvious next choice. It’s one of my favorite ice cream flavors and if you make all three flavors and you can have Neapolitan snow ice cream! This would be excellent with diced strawberries mixed in too. In other news, what are your favorite ice cream flavors? We’re getting another snow storm today so I’m looking to experiment with even more variations! 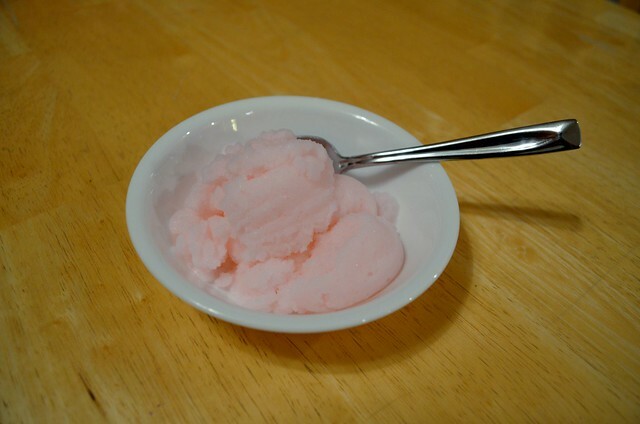 In a large bowl, mix together sugar and strawberry milk. Stir in enough snow to make an ice cream consistency. Enjoy immediately! How big would you say the bowl should be? Do you think it would be close to a half gallon of snow? I always just stick my biggest mixing bowl outside – it probably collects a gallon or two. The snow melts down, so you need quite a bit to make the ice cream – but exactly how much varies based on what texture you prefer.